Weather: Mid-40 degrees; Cloudy; Ahhhhh! That's a perfect summation of my Ely Marathon experience. Let me state unequivocally that my feelings have nothing to do with the event itself, which was top-notch. Rather, it has to do with the end result which I will get to in a minute. (My book on "How to Write Goodly" calls this "foreshadowing"). 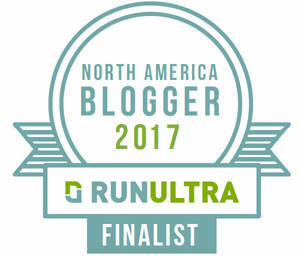 I haven't run many marathons lately. In fact, in 2017 I ran my first and only of the year on New Year's Eve. Determined not to wait so long again in the year to continue my streak of qualifying for the Boston Marathon (I have done so every year since 2005), I signed up for a marathon in late January. The race did not go my way and I ended up running the half-marathon instead as 100% humidity threatened to shut down my body. As such, I found myself here in late September lining up to complete my first marathon of the year. This was going to be quite the experiment. I was severely under-trained for this marathon given mostly to the fact that the town I live in, Austin, Texas, has been on virtual fire this summer. The third hottest summer in Austin history just wrapped up and these temperatures and humidity do not make for a good training day for Dane. 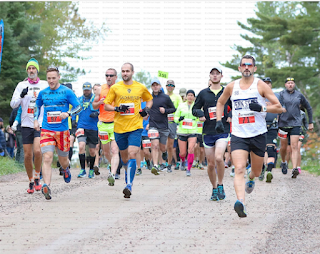 In addition, the Ely Marathon is also a rather challenging course with non-stop rolling hills, long hills, short, steep hills and other hills I cannot think of categories for them in which to be placed. However, race day temperature called for it to be just about the most blissful race I have run in the past, well, probably five years. So my theory to be tested was how much good weather helps an under-trained runner on a tough course. The only way to find out was to head to the starting line. 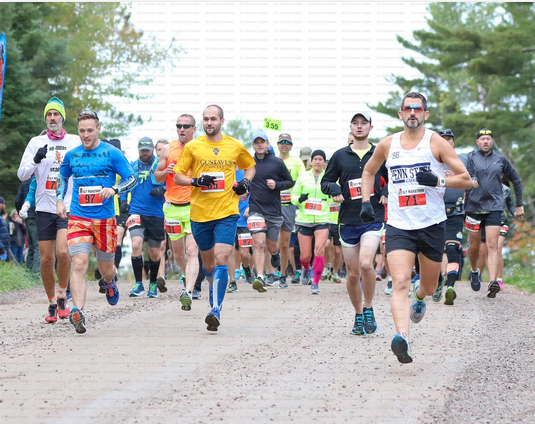 What first drew my attention to this relatively new marathon tucked away in the Boundary Waters of northern Minnesota was the inclusion of something I had seen nowhere else in the world. Along with your marathon and half options, the Ely Marathon allowed a variety of ways runners could portage, or carry, a canoe for the entire marathon course. This sounds as ridiculously difficult as one could imagine. Yet as we lined up to run this marathon, the canoe portage-ers all seemed in remarkably good spirits. Egads. The weather delivered as promise with cool temps, relatively low humidity, complete cloud cover, and elated sighs emanating from me all morning long. As everyone lined up for the start and no one seemed to wish to join me at the front of the line, I tried to needle other runners to join me. Finally, after much cajoling, including saying there was no need to run further that 26.22 miles if you dodn't have to, a few toed the line with me. The air horn started and away we went. In the first 100 yards on a dirt road, we went down a hill and then back up the other side. This would be basically a microcosm of what that vast majority of the first half of the marathon would be like. 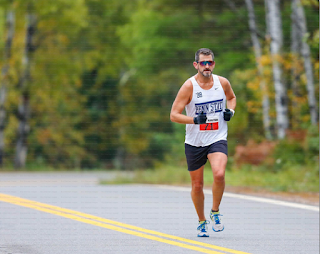 After the first mile the dirt a road turned to a paved one and I was all alone except for the lead car pacing me through the quiet forest roads in a foggy morning within a stone's throw of Burnside Lake on our right. 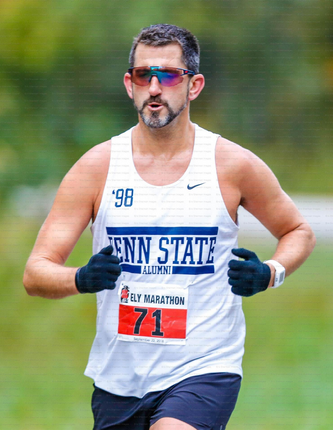 By the second mile it seemed clear that no one was even going to attempt to stay with me in spite of the fact that I was hardly tearing up the roads, running right at a seven-minute pace. I was hoping at least one or two runners would challenge me here so I didn't have to shoulder the load. Yet as no one did, I simply tried to leave them behind. I didn't want to make it easy for anyone. Hitting the third mile left me with a smile as we passed a woman with a sign saying we were 980 rods done. As Ely is in a canoe and outdoorsy-friendly place it has been billed since its inception as the 8390-rod portage (a rod being 5.5 yards and portaging being what canoe folk have to sometimes do to get their boat from water to water over land). 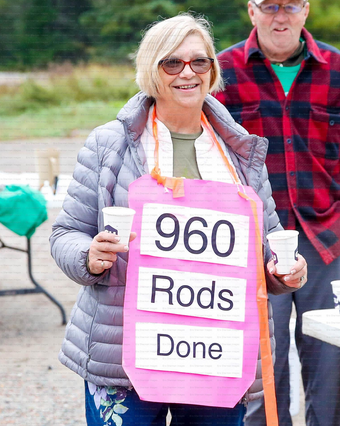 This 980 rods done sign was a long way of saying it was mile three. I loved the local touch. I knew the next few miles had some of the hardest climbs of the day so I just kept my head down, focused on running the tangents the best I could on a course that twisted and turned quite a bit. As the miles ticked by I continued to feel surprisingly good. I had been as nervous for this marathon as I had for one in years. I was wondering how I would perform given my lack of training but so far I felt very good. I almost never feel very good in the beginning of the marathon so this was a huge shocker. My time was probably not going to be stellar (right around 3:10 was my guess) but hey, it looked like I was going to win. One shouldn't think about a victory so early in the race but where there are virtually no crowds, no one challenging you, and not much more to focus on but I will admit I let my mind wander. The seventh mile produced the steepest hill of the course and I was glad it was over. A quick glance over my shoulder revealed no one in seeming striking distance. Then I saw a few shirts a little closer than I would like them to be in the far distance. I wasn't home-free yet. Right around here the truck which had been my lead vehicle pulled to the side and a motorcycle took over. From what I can gather, I had built a sizeable enough lead that they needed the truck to go back to help lead the other runners. Being a little bit of a snob I wanted to say that if they wanted a lead vehicle then they needed to get up here in the lead, damn it. But soon I had a motorcycling buddy waving down opposing traffic to slow, cutting a tangential line along the roads, and being basically my only friend on the course. Occasionally we would pass a driveway to some cabin which lead way back and a person or two had positioned themselves out in a lawn chair to cheer on runners. This sort of thing always warms my heart. Even their quiet cheers and soft-spoken "way to go"s were very appreciated. I knew the last of the big hills ended around the tenth mile and I was looking forward to trying to use a long downhill to get me rolling. I was still averaging right at a 3:10 pace which was a nice thing. I passed the start of the half-marathon and knew I would be coming down to where the halfers spit out onto the road after doing some out-and-backs which I would also do. The Echo Trail (which was paved) was where we had been running and as we made a hard left onto Grant-McMahon Boulevard (which was about as un-boulevardy as one could imagine nestled deep in the woods here) I enjoyed another nice steep downhill. Up ahead I could see the half-marathoners coming out of where I was going in and all was right in the world. I passed one of the portagers and told her she was a rock star. She said I was the one winning the race to which I replied "But I'm not carrying a boat!" The weather remained cool, the drinks were plentiful from the volunteers, and I felt I had a great lead. Time to just do another thirteen miles and call it a day! A rather abrupt uphill here was made a little easier as the half-marathoners streamed by on the other side. Getting a little human contact helps the psyche a bit even if it only lasted about a half-mile. Marathoners branched off again here and I was all alone with my motorcycle. I knew there was a complete out-and-back sections coming up but couldn't remember exactly where. I was aware this would give me my first glance of how far the runners behind me were and man I was really hoping it was far. I turned around on this dirt road and began heading back. Sure enough the once lead car brought some fellas into my sight. I looked at my watch to see how much a lead I had on them and it showed three minutes and twenty seconds. A few feet later I hit mile sixteen. Two hundred seconds faster than me in ten miles is what these guys had to do to win the race. Not insurmountable but quite safe. In order to make it even harder, I ran the 17th mile as fast as I had run a mile since mile eleven. My win was in the bag. 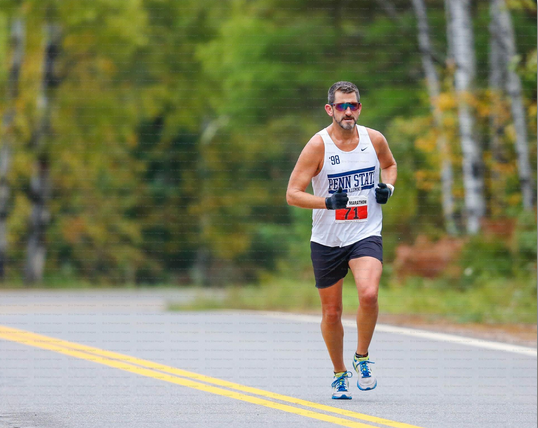 On another lollipop portion of the course which I had hoped was another out and back so I could see any greater lead I had built, I instead saw the tail end of some of the other runners who had been behind the chasers right behind me. I figured that everything else was copacetic with regards to how far the main chasers were behind me and continued my ways. I knew I slowed a bit but the hills had been tough here and the guys behind me had to run them as well. I took just a little bit of a breather break before mile twenty and saw I ran my first eight-minute mile of the day. With a bit of a climb here it wasn't unexpected but I knew I had to get going. As I approached an aid station perched at the top of short but brutal climb at Mile 22, I passed one of the few canoe portagers out on the course. Even though I wanted to walk this hill, doing so next to a person carrying a canoe made me push forward. At the aid station, however, I did stop to grab two cups of water. It was still not out of the 40-degree range temperature-wise but I was thirsty and sweating. I poured the two cups into one, drunk them fully, and turned around to see what was behind me. One of the runners who had been over three minutes behind me just six miles previously was now just 50 yards away. 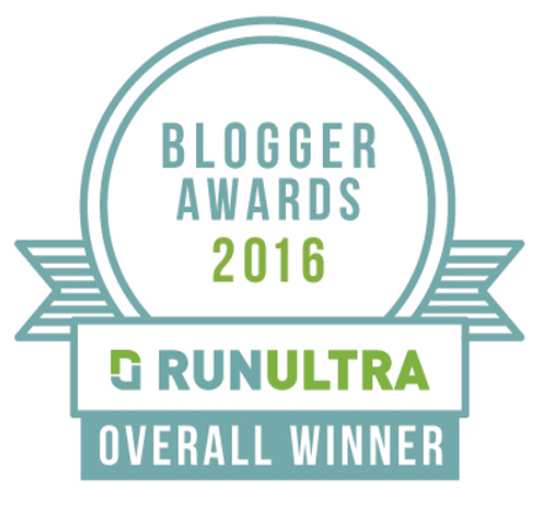 I began running with a new vigor but I also knew that it was just a matter of time. If he had made up such a huge distance chances are he had way more leg speed than I did. I held him off for about half of a mile but soon his bright orange shirt was passing me. He didn't say "Good job" and I didn't either which to me meant we were both unsure of what the other had in the tank. I wasn't expecting a race for the last 5k but here I was in the middle of one. For the next half mile until 24 he steadily increased his lead. It was not a lead I couldn't overcome but it was starting to get there. The road began to rise and a long hill appeared. Next thing I knew he was another 100 yards in front of me. I told someone later when he passed me he not only took the lead but he took my soul. A few yards later is where it permanently left me. Only a small downhill kept this mile from being extremely slow and as we turned to the 25th mile, my energy was ebbing. I am fully convinced if I had been in the lead this would have not been the case. At the aid station I again grabbed two drinks and this time walked for a good ten seconds or more. 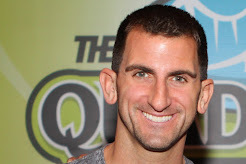 I wasn't going to BQ, I wasn't going to win, and now I was just crestfallen. I entered the last mile which not only passed the finish line before we could actually go to it but had a cruel hill running up the city streets of Ely. I came to a dead stop and just tugged on my shorts as I bent over. A concerned fan asked me if I was OK and I said "I'm not right in the head but I will make it to the finish". This got a laugh and a cheer from the people gathered there. As I started running again, the race director appeared on the side of the road cheering me on and offering encouragement. I smiled weakly, happy my sunglasses were hiding the exhaustion in my eyes. Up the hill, two turns, back down the straightaway I went until I could see a funnel of fans, a cameraman, and the finish line in a beautiful park in the middle of town. Half an hour earlier I was wondering if there would be a tape for me to break. 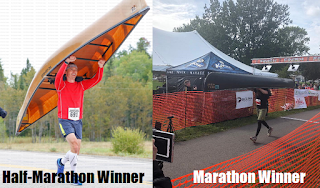 I have won five marathons in my life and only one of them has had a tape across the finish line. I learned later there was one here but unfortunately it was not for me. 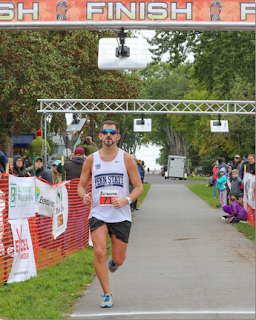 I crossed the finish in 3:18:01 for my 161st marathon ever. I have now placed second in my last three marathons. Those previous two came as surprises as I thought I was further back. This one was just a big ole bummer. Well-meaning friends told me the time was still good and I should be happy with second place. And truth be told, give how under trained I was and the difficult of this course, I can say that if I had started the race in fifth place and maintained it the entire time, I would be much happier. But losing a marathon that late in the race is not fun. Until you have done it, "But second place is still great" rings a little hollow. I stayed around after the race to do a book signing at the post-race party but mainly I wanted to see the canoe portagers come in. While there was the usual applause for most runners coming in, especially the slower ones, the park erupted whenever anyone carrying a freaking boat came ambling across the line. I say ambling even though the half-marathon winner literally skipped across the line to the amazement of everyone. My trip to Ely was made specifically to see how this race compared to some that I think are an absolute must-run. While I can't say that you can't run fast here (it ends up that the man who beat me, a multiple marathon finisher, set a THREE minute personal best on this course, which is just mindbogglingly) chances are the hills will take a lot out of you. But what the scenery gives you, how well the town embraces your presence, and what the volunteers and organizers do to make you feel welcome is indeed something which must be felt. 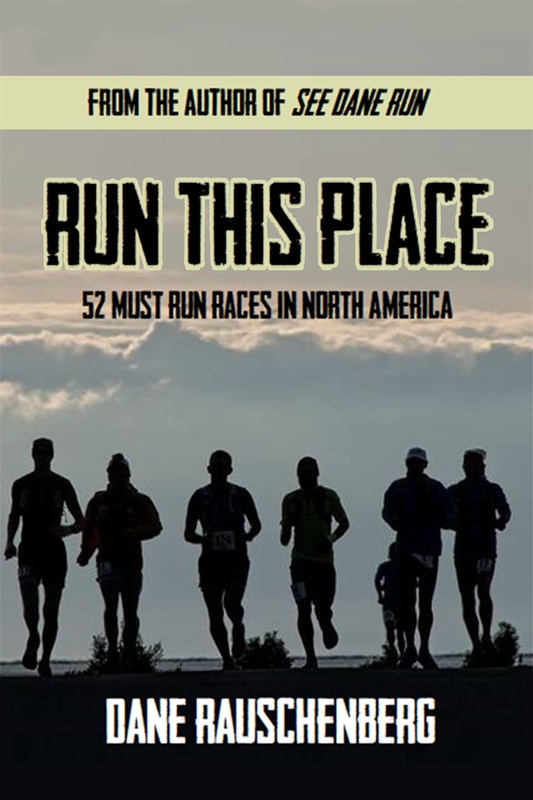 Granted a few other marathons in Minnesota get a great deal of publicity but you would be ill-advised to sleep on this new little gem tucked up in the Boundary Waters of Northern Minnesota. I highly suggest you book a massage at the Pebble Spa Company just a few blocks from the end of the race as well. I did and without a doubt one of the reasons I recovered even more quickly than usual was because I pampered myself at this excellent establishment. 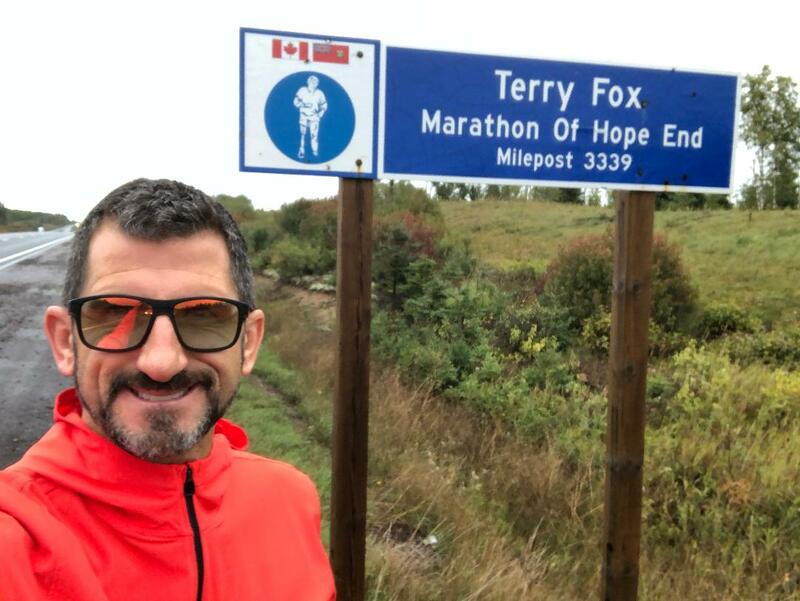 Go run it, and then, be adventurous like I was and drive another three hours to Thunder Bay, Ontario where you can pay homage to where Canadian legend Terry Fox was forced to stop his run across Canada way back in the early 1980s. All in all, this race really boosted my confidence and proved to me that good weather really is a huge equalizer. I look to improve greatly on the much easier course in Victoria, British Columbia in less than two weeks as I once again strike out on the 26.2 mile journey. 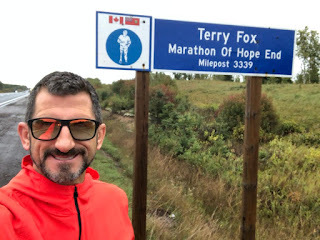 My first marathon in Canada since my first ever sub-3 in my 42nd marathon of the year in Niagara Falls back in 2006 beckons. I don't know how it is possible that it has been twelve years since I have run that distance in our neighbors to the North but as the featured speaker for the race, I plan on putting a darn good show. Greatly looking forward to being the featured speaker for the race as well. Hope to see you there!